Through this frame agreement, CNBM and Fives defined areas of collaboration to benefit from either party expertise or technologies. The parties will explore projects together, in plant upgrade, plant expansion and new plants to implement Fives technologies, such as FCB Horomill® grinding system, FCB Pyro-line and Pillard burners to reach the highest level of energy efficiency, emission controls and product quality. The scope is international. Expertise and key technologies are at the heart of this cooperation agreement. By partnering with Fives, an international engineering group, CNBM, the largest comprehensive building material industry group in China with a leading position in cement production & plant construction, acknowledged Fives’ ability to develop sustainable technologies providing unsurpassed performances in electrical consumption and CO2 emissions. CNBM and Fives’ complementarity will create opportunities to collaborate, aiming at improving plant energy efficiency, reducing thereof CO2 footprint, preserving natural resources, while increasing cement quality and reducing total cost of ownership. Fives' performing technologies are acknowledged by CNBM. 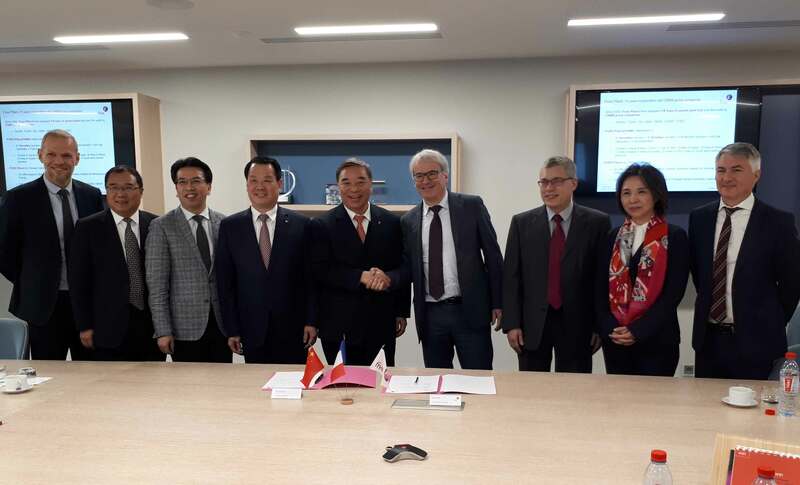 The ceremony gathered several top level representatives from both companies, including Mr Song Zhi Ping, Chairman of CNBM and Mr Frédéric Sanchez, President of Fives. This agreement was the occasion to reaffirm their strong commitment to multilateralism, which is the right direction to develop collaboration between Chinese and European enterprises, meeting both interest. With full-line services covering scientific research, manufacturing and logistics, CNBM is the largest building materials manufacturer in the globe and world leading comprehensive service supplier. With total assets of € 77 billion, CNBM has a workforce of 250,000 employees and generates an annual income of € 38.5 billion. The Group also owns 15 listed companies, including 2 listed abroad. The Group produces 530 million tons of cement clinker, 460 million m³ of ready-mixed concrete, 2.2 billion m2 of plasterboard, 2.24 million tons of fiberglass, and 16 GW of wind turbine blades per year, all of which rank the first in the world. The Group is also the No.1 player in the international cement engineering market and the international waste heat recovery market. New materials business is a new rising force of the Group, and CNBM has transformed from a building materials enterprise centered on cement business into a comprehensive building materials and new materials industry investment group integrating cement, new material and engineering technical service. As an industrial engineering Group with a heritage of over 200 years, Fives designs and supplies machines, process equipment and production lines for the world’s largest industrial players in various sectors such as steel, aerospace and special machining, aluminium, automotive and manufacturing industries, cement, energy, logistics and glass. The effectiveness of its R&D programs enables Fives to design forward-thinking solutions that anticipate industrials’ needs in terms of profitability, performance, quality, safety and respect for the environment.